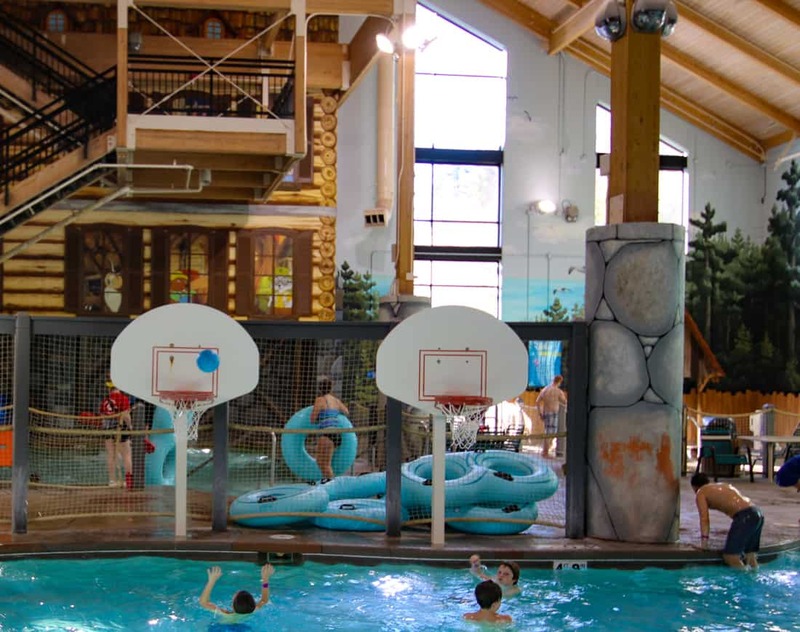 Great Wolf Lodge is so much more than its waterpark. 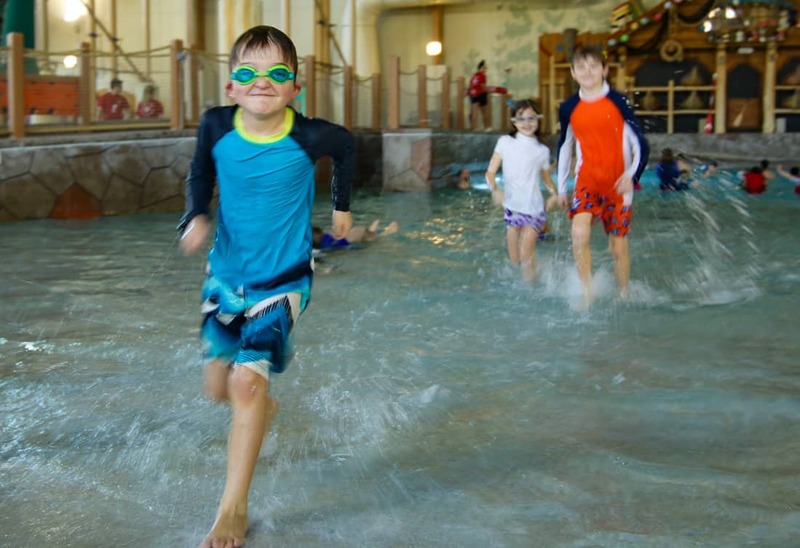 Great Wolf Lodge is a family destination ideal for a jam-packed weekend of action. I used to take pride in telling people in the Luxe Recess brochure that I do not feature indoor waterpark hotels. I’ve really learned to eat my words with humility. Two and a half hours after checking in at the Fitchburg Great Wolf Lodge and I’m a wearing wolf ear headband, playing air hockey, and having a grand time. My best friend and I had grabbed our kids, loaded a minivan with snacks and set off for some aqua adventure. 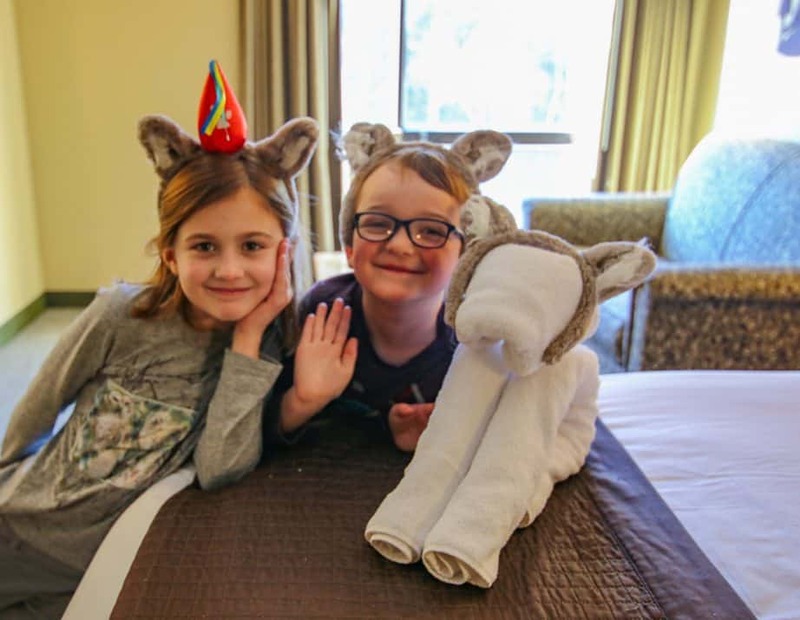 We each had daughters celebrating birthdays, and Great Wolf Lodge was the one hotel my kids have persistently begged to go to that we hadn’t crossed off the list yet. We were ready for anything, but I was hoping we all got a few hours sleep. During the winter months, the lodge feels warm and cozy in the lobby. 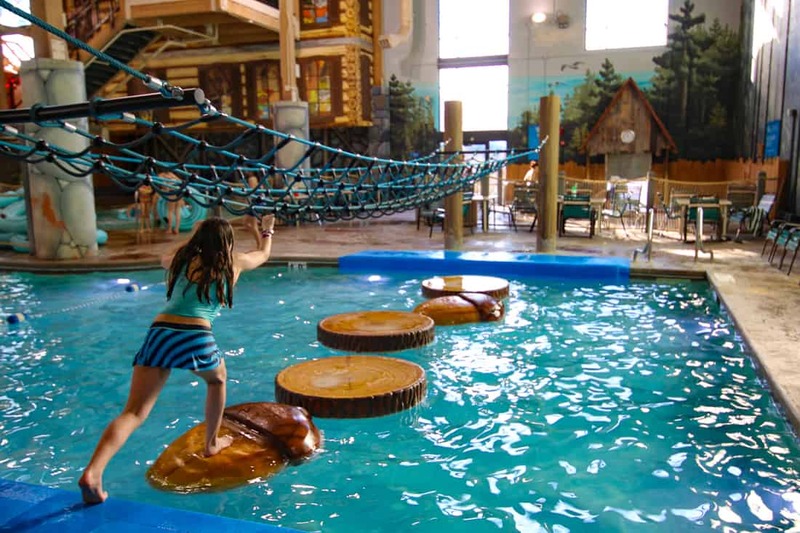 These resorts are best known for their indoor water parks, providing ample physical activity on cold, rainy weekends. But the waterpark was only one among many activities that families could do on property. The resorts offer massive arcades, mani-pedi spas, an interactive quest, bowling, ropes courses, and mini golf. 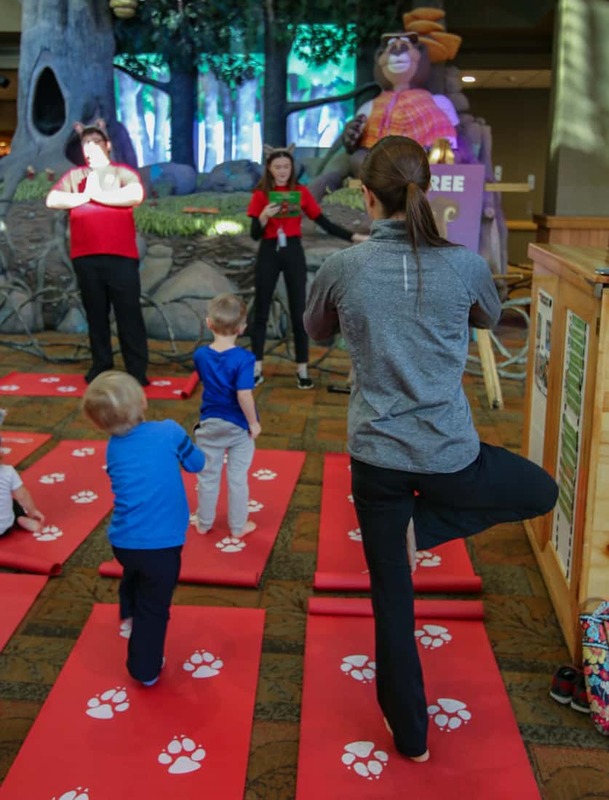 There’s also a list of daily activities that are suitable for younger children led by resort staff like story time, crafts, and yoga. My daughter just turned 13 so I was curious how teens would enjoy the facilities. Had she been with friends her own age, nothing would’ve stop them from doing everything. It really works for all ages for a high energy birthday slumber party. There are large pool areas with slides, a lazy river, water obstacles, and a wave pool. 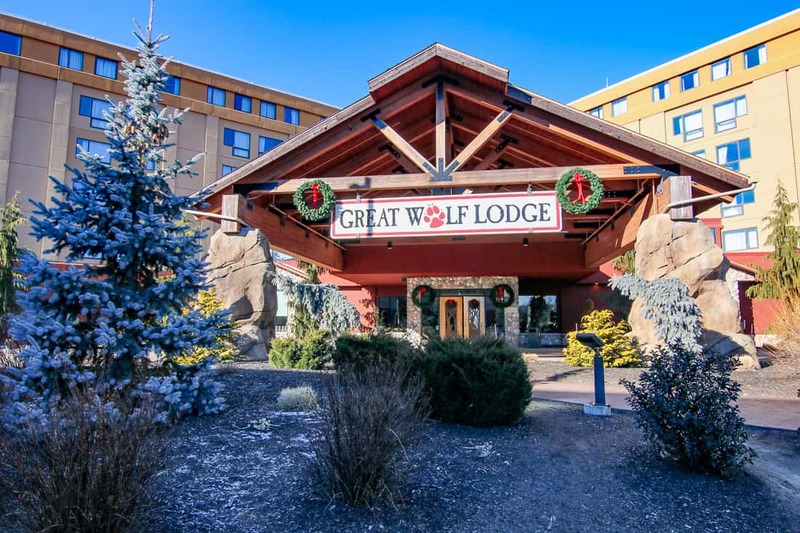 Where is Great Wolf Lodge located? There are 18 properties total around the US and Canada. The resorts are typically in suburbs of large cities like Seattle, Atlanta, Charlotte, Chicago, and Boston. There are also locations in popular vacation destinations like the Poconos, Niagara Falls, and Anaheim, California. The Grapevine, Texas location and the Niagara Falls location are some of first to debut the new look for the Great Wolf Lodge rooms. Gone is the caramel and khaki color scheme. These new rooms are, frankly, pretty nice. Rooms with the kids’ bunk beds are still there but now surrounded by the new grey walls and modern fixtures. 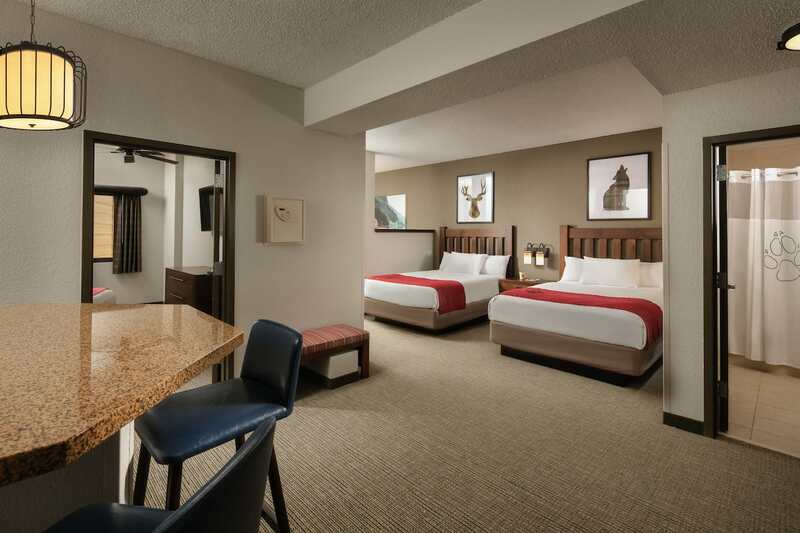 The new rooms at the Grapevine, Poconos, and Niagara Falls locations are modern and stylish. The Poconos location will complete their room renovation by Memorial Day for those in the Tri-State area. The lobby area is the nexus of all activity for guests not enjoying the waterpark. During the day, zoos of parents are toting luggage to their rooms or toting kids to the pools in their swimsuits. Everyone is walking like there is somewhere to be that they are late to. Lodge employees begin evening activities in the lobby. Bingo starts at 6 PM. The average age of the players (4?) will keep any serious bingo player (or middle schooler) away. But at 7PM, a dance party begins, and the lodge energy changes. It becomes a free-for-all. Amiable staff members lead the children in aerobic dance moves. Parents huddle around a cart selling beer and flavored moonshine if they have the energy to stand. I saw babies only in their diapers, naked toddlers, and preschoolers in their footie pajamas all oblivious to their varying wardrobes while trying to floss. After a few Taylor Swift and top 40 hits, Elton John’s “I’m Still Standing” came on. It was clearly a motivational anthem or a subtle hint for the parents to get up off the lobby floor. The lax, kid-dominated atmosphere meant that parents were at ease rolling with the mayhem. No one looked stressed. 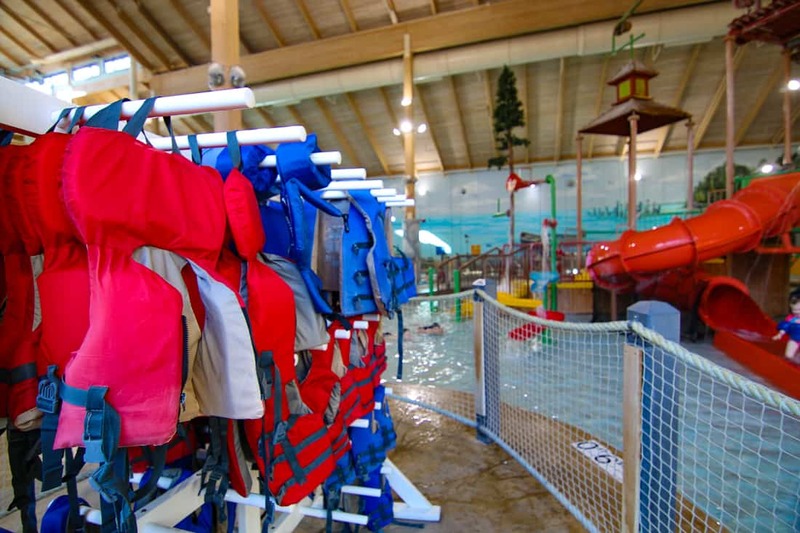 Great Wolf Lodge is truly made for families with children in the most challenging ages for travel. 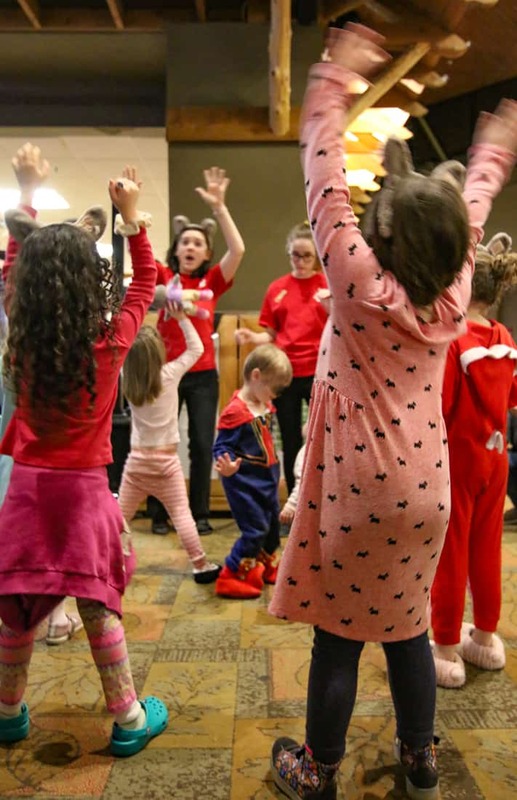 Birthdays are festive and efficient at Great Wolf Lodge. 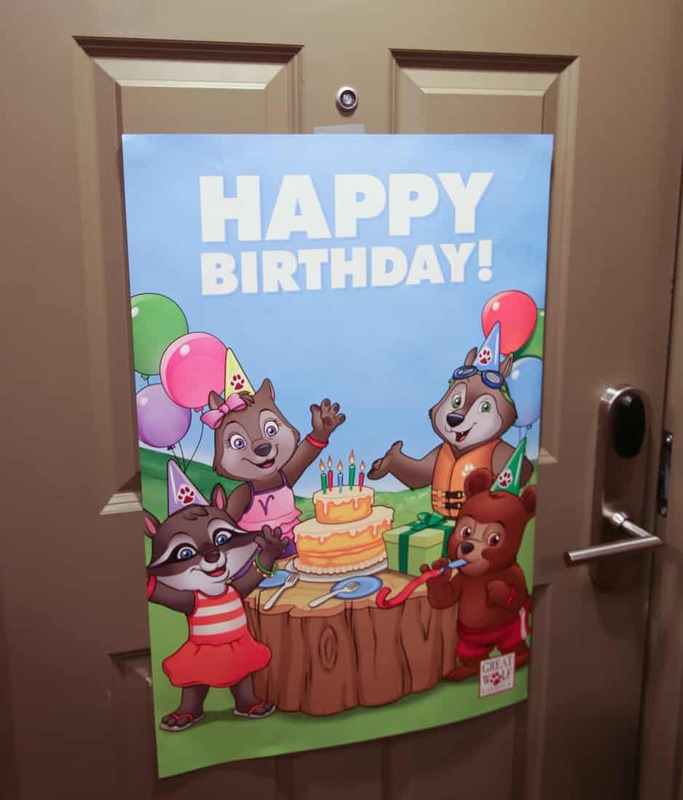 Great Wolf Lodge has a reasonably priced birthday package guests can pre-order that includes a Great Wolf Lodge birthday cake, plates, napkins, a pizza voucher, a balloon bouquet, card, and a hotel door poster. 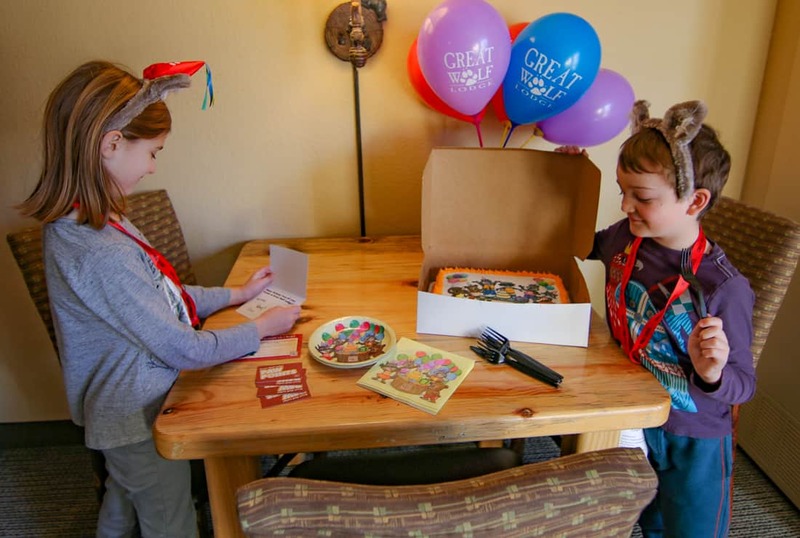 The birthday package includes the cake, balloons, birthday wolf ears headband, a door sign, a pizza voucher, and a $40 arcade card. It also includes a $40 arcade card, so the $89 price tag is pretty reasonable. The Lodge gets birthdays right. We had the Royal Wolf Den Suite which is one of the premium suite categories that sleeps six. It starts with a standard hotel room with a queen-sized bed and a double sleeper sofa. 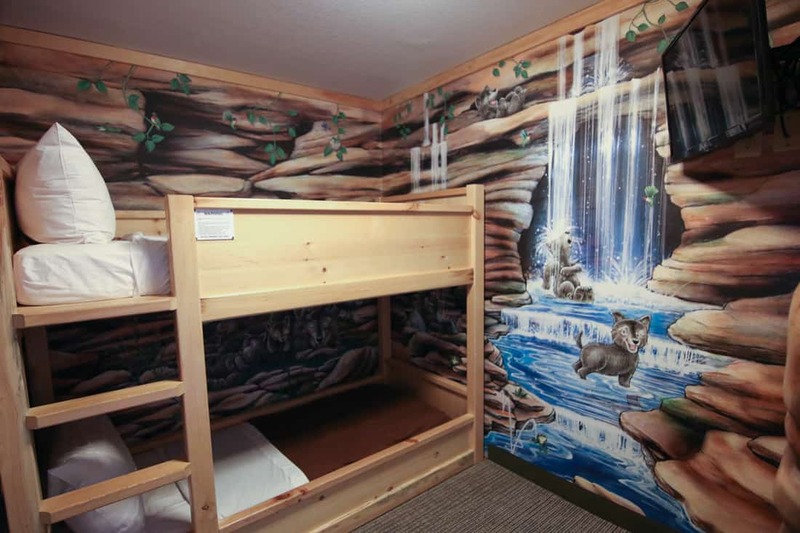 Around the corner, there are two themed bunkbeds inside the wolves’ den. There’s an adjacent king-sized bedroom that had a particularly comfortable mattress and a private door. Each of the three sleeping areas had their own TV. Rooms came equipped with a microwave and a mini fridge and coffee maker. The bathrooms were standard with vinyl shower curtains. 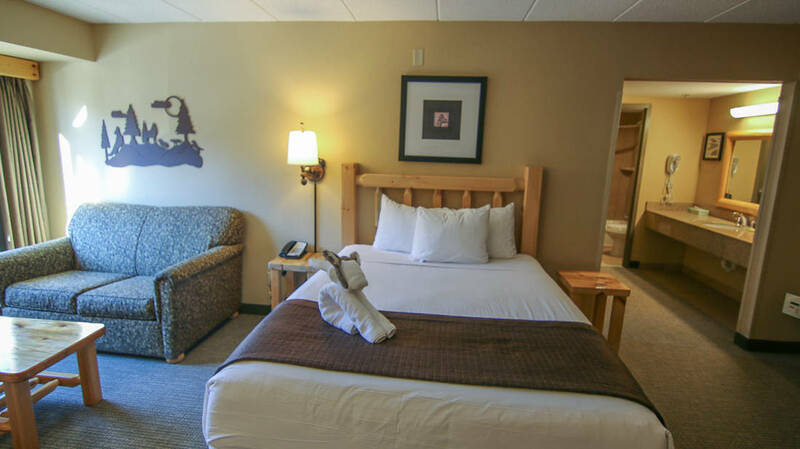 The largest Great Wolf Lodge family suite has three beds in the wolves’ den and can come with two queen beds in addition to a king bedroom. 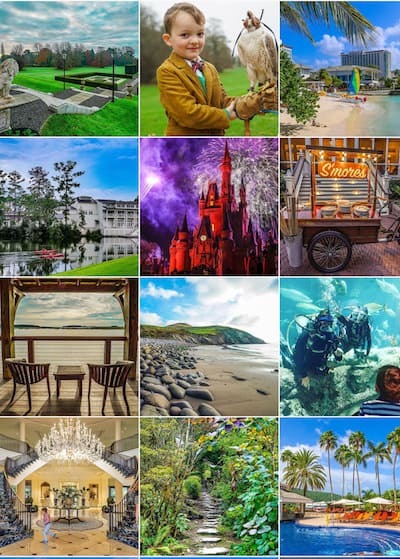 These layouts are perfect for a big slumber party, but if you’re going with a huge group of friends and family, it may make more sense to reserve your own rooms so that everyone can get the best night sleep after incredibly active days. We took most of our meals in the restaurant called the Lodge Wood Fired Grill. They offer buffets at breakfast and dinner, and menu service at lunchtime. 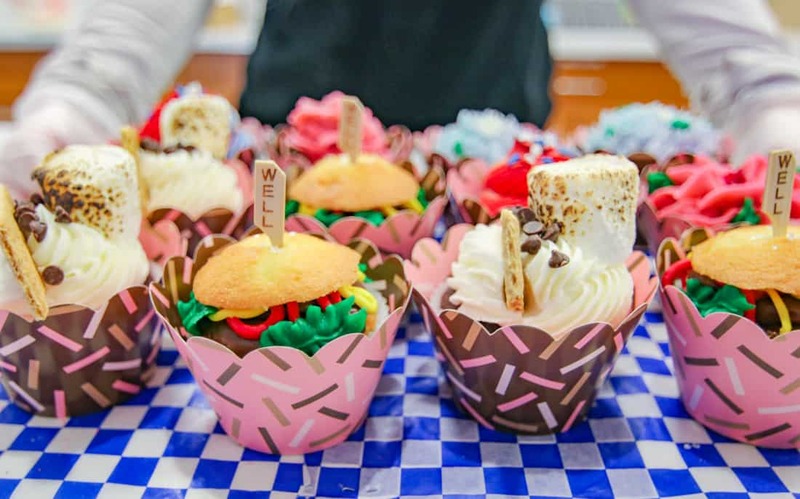 The specialty cupcakes for sale at the Bear Paw. You know they can handle grilled cheese, chicken fingers, and quesadillas, so it’s critical to judge their food based on what adults can enjoy. My grilled shrimp, farrow, and arugula salad was delicious. The dinner buffet satisfied, and while it wasn’t an adventure by culinary standards, it was a comfortable journey with a taco bar, barbecue, and a baked potato bar. The kids had their own buffet with fruit, crudités and hummus, chicken nuggets, tater tots, and mac & cheese. 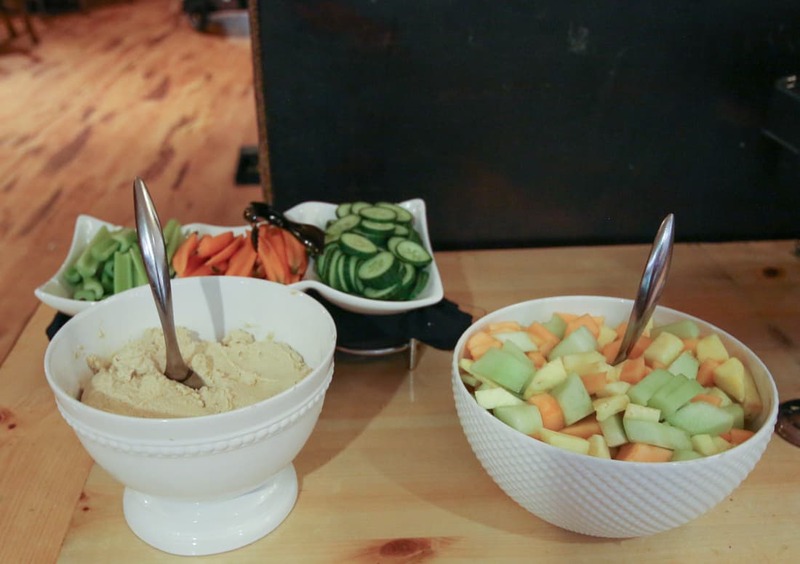 Children have fruit, crudite, and hummus in addition to kid staples like chicken fingers, mac ‘n cheese at dinner in the kids’ buffet. There were loads a vegetarian and gluten free options in the buffet, but vegans might need to specify what has no dairy in its preparation. I recommend reservations for dinner because there was a wait, and I wish I’d had the foresight to reserve a table in advance. Obviously, it was easy to kill time in the nearby arcade and participate in the various lobby activities while we waited. For a more casual option, there is that Wachusett Brew Barn where families can share appetizers and small plates. Parents can enjoy local craft beers. 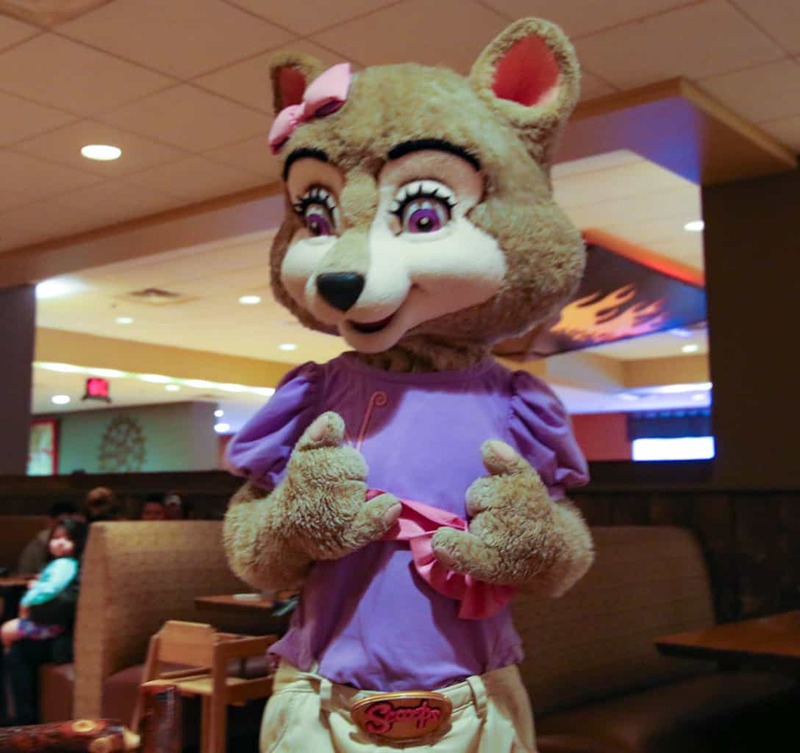 Great Wolf Lodge offers several discounts and promotions throughout the year. It’s best to subscribe to their newsletter so you can stay up-to-date with the best deals they provide. There are flash sales and mystery sales sent with regularity to their email lists. The best prices are obviously during the week, and rates increase on weekends. Booking in advance will often get you the best room rate, as last-minute reservations tend to be sold at the premium price. Standard rooms typically start around $250, which can vary depending on the local markets. Premium themed suites could run over $600 per night based on the local market. The reservation system offers many experiences to purchase in advance for your stay. We found the Paw Pass to be of good value and worth it. 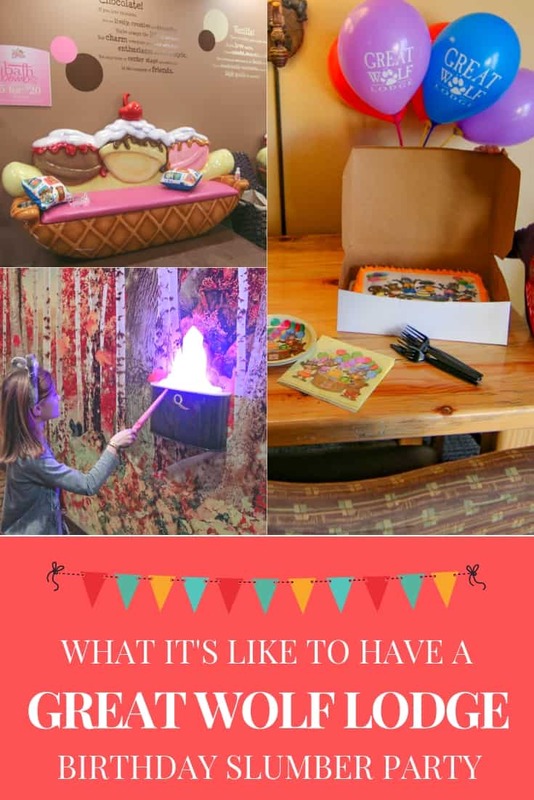 The Paw Pass ($39) includes one Magiquest game with a standard wand, a five-dollar arcade card, a credit for candy at their gift shop, and a scoop of ice cream at the Bear Paw sweets shop. Loved this excellent service when one of the kids had lost their Paw Pass. For younger children there’s a Pup Pass ($39) that includes a Build a Bear animal with a hoodie instead of the Magiquest game. 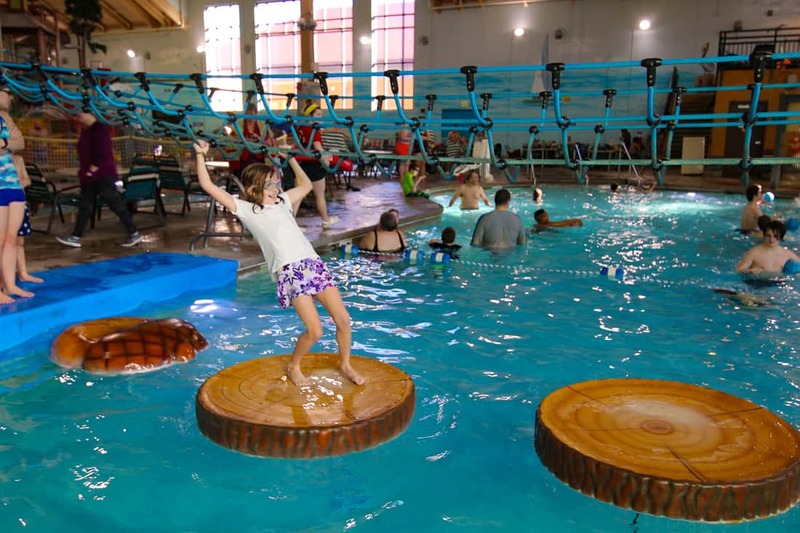 The Wolf Pass ($59) is the all-access pass that includes the Paw Pass features as well as a round of mini golf, a game of bowling, and a ropes course and climbing wall. If you don’t see yourselves inside the water park the entire time, I highly recommend getting one of these package deals for all of the non-swimming options. 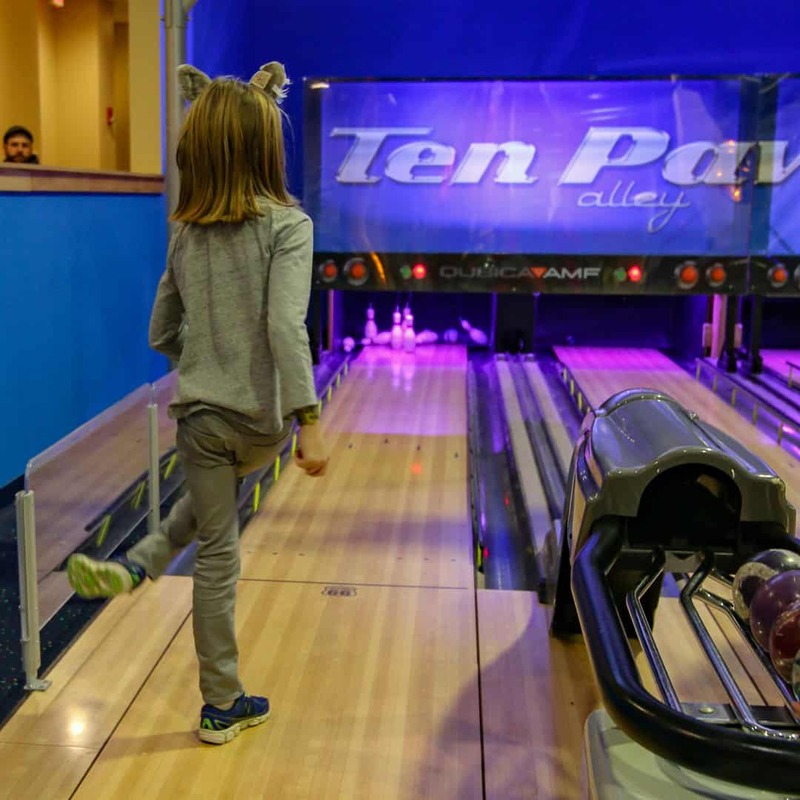 The Wolf Pass covers a game of bowling, mini golf, and the ropes course, too. The Paw Pass proved to be a good deal, and they were very flexible with how the credits were applied. I had no intention of getting my children 12 ounces of jelly bellies so they only allowed us to substitute for smaller portions of different candies. I loved that we lost a paw pass and a pizza voucher, and— both times— someone had turned them in. We communicated guest services team member by text throughout our stay. Use this service! These waterparks are serious in scale. There are actually two separate parks in the Fitchburg location we visited. 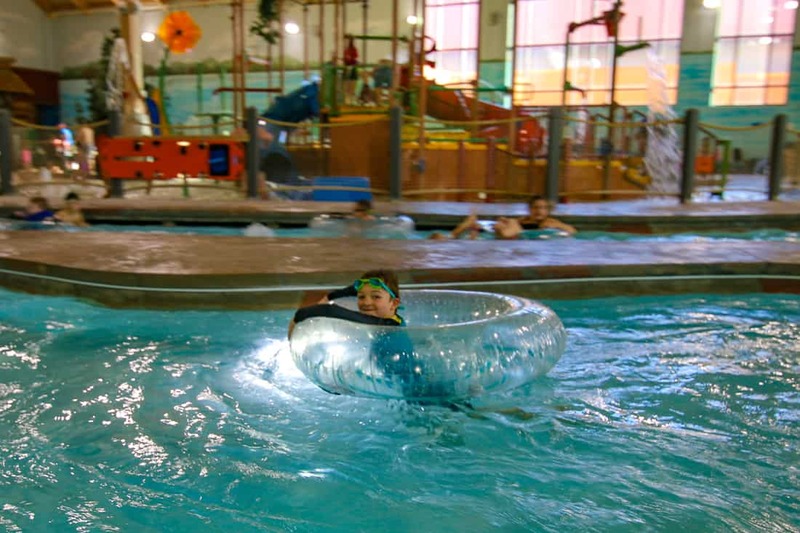 There is a wave pool, a splash pad pool and lazy river, and a variety of slides for many thrill levels. The wave pool is just the right amount of excitement without being too rough on young swimmers. I loved the seriousness the life guard staff watched the pool areas for the less competent young swimmers, and life vests came in all sizes. There is a snack bar inside the waterpark, and it is indeed heated for bathing suit weather year-round. If you aren’t swimming, be sure to dress in layers you can remove while watching the kids. Lockers are outside the park doors to store valuables you didn’t leave in the hotel room safe. 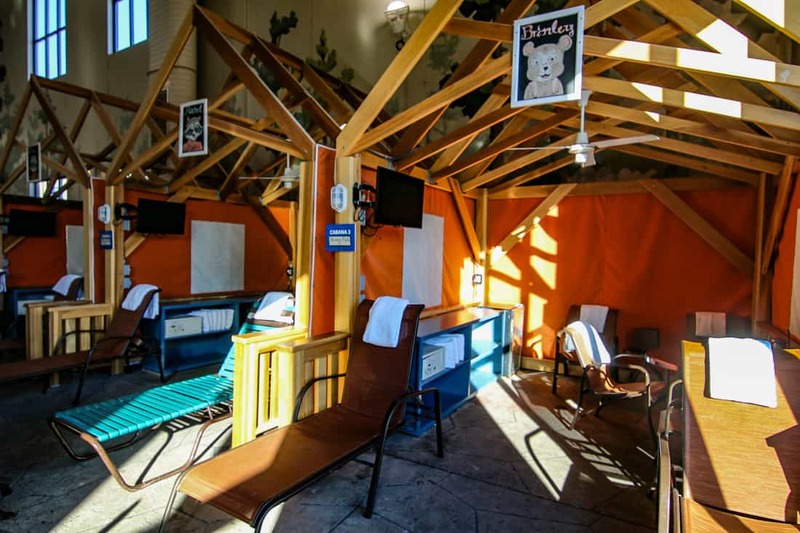 There are also cabanas inside the park areas, but given they are not really staffed with wait service, I am not sure I see their value. Cabanas at the Great Wolf Lodge. 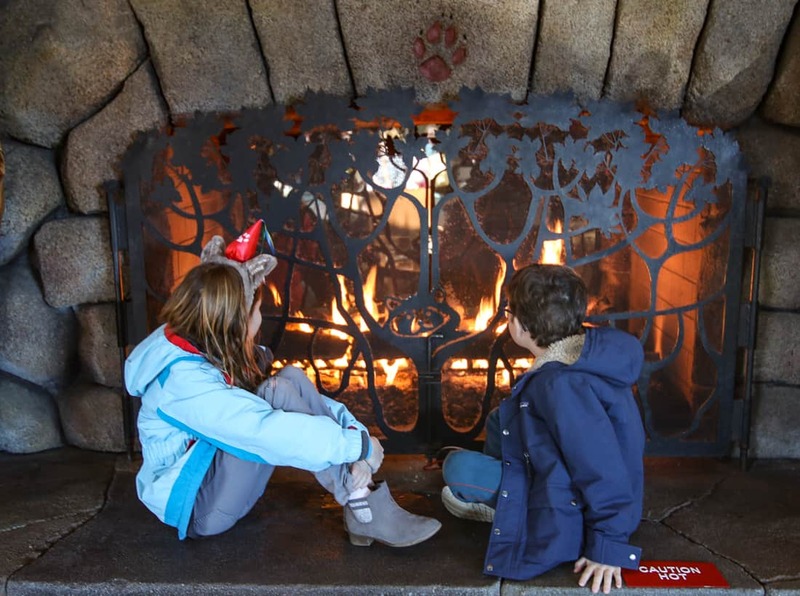 Magiquest is an interactive scavenger hunt throughout common areas of the resort building. If anyone has been in a Disney cruise, it is similar to the Midship Detective Agency. The dragon starts kids on their wand adventure. Children start at the Magiquest shop to pay for the game and select a wand. There are many options, and your children will take a lot of time deciding which one they want. The Paw Pass includes the cost of the want and game. 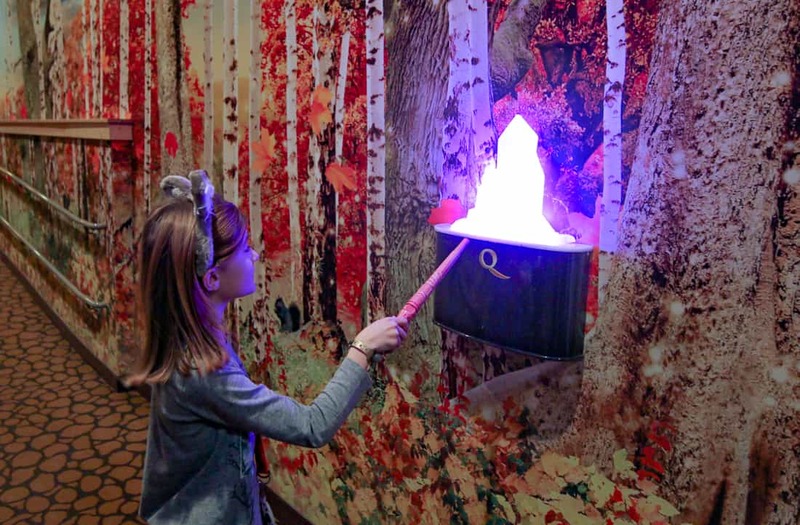 Magiquest is a wand game is an interactive quest throughout the resorts public spaces. Armed with their wands, children find various places at the resort to wave them. Red eyes of a dragon will glow in the lobby to kick off the adventure. The path of the game takes children into the hallways that connect the lobby to the waterpark and activity areas, so it works as a way to orient one’s self to the resort after checking in or while waiting for a room to be ready. The multi-room arcade was a huge hit for the kids. There were some traditional arcade games, but most games were those that generate tickets to exchange for prizes at the end. A particular favorite was a laser obstacle course called Laser Frenzy. One had to maneuver through a small room like Tom Cruise in Mission Impossible without the beams touching you. 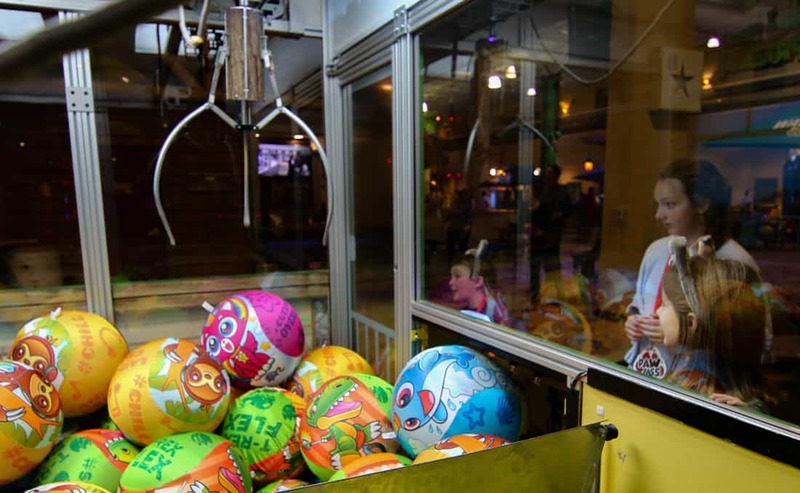 The arcades and games selection is extensive and will easily occupy kids for a few hours each day. There is a casual pizza place and an ice cream and bakery within the arcade at the Fitchburg location. There were adorable specialty cupcakes for sale. What the resort calls a spa is really a mani-pedi bar for little ones. 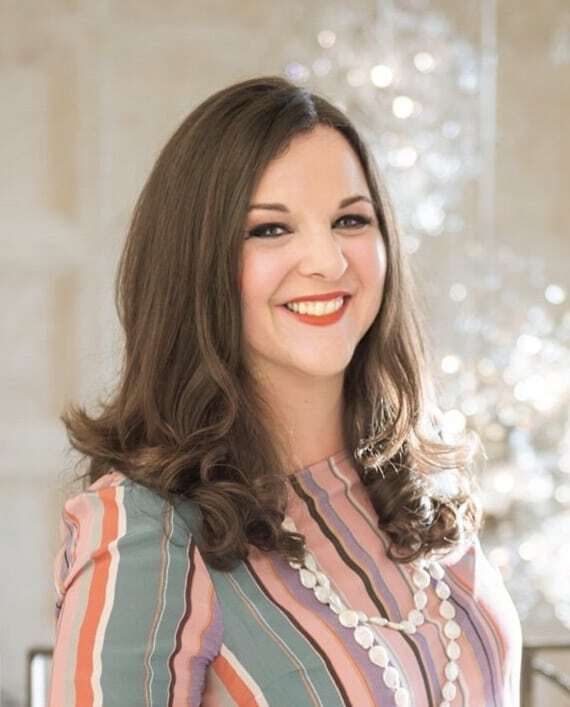 Mom and daughter services are available, but the treatment won’t resemble a licensed salon, so I suggest just sitting with your children instead. 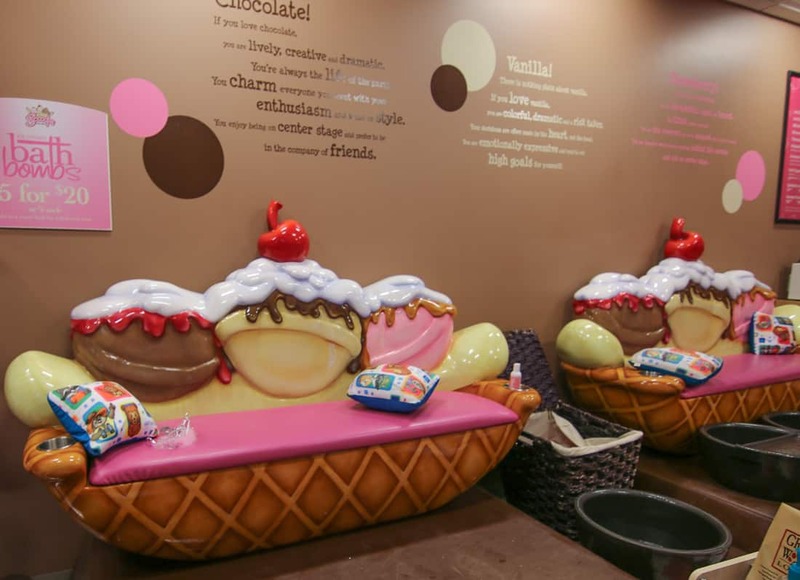 The Scoops Kids’ Spa is for simple nail services. There are accessories for sale to create a princess makeover, too. My daughter at 13 loved the ropes course and enjoyed completing the course a few times. My son ascended the ropes course, and I thought he changed his mind as he stood frozen at the first section. He was exactly 48 inches, the minimum height required. I asked the staff member who managed the course to go retrieve him. This staff member was incredible and helped my son learn the ropes and not give up. 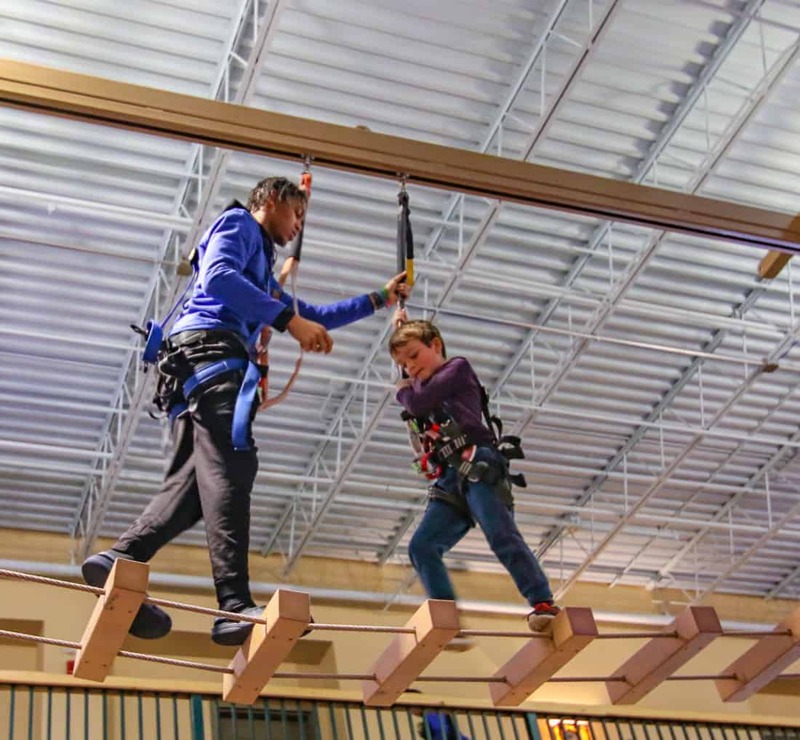 But far more impressive, the staff person had a conversation with my son up on the ropes, and suddenly he moved him across the first element, guiding my son through until he felt comfortable. Then I couldn’t even get him down. 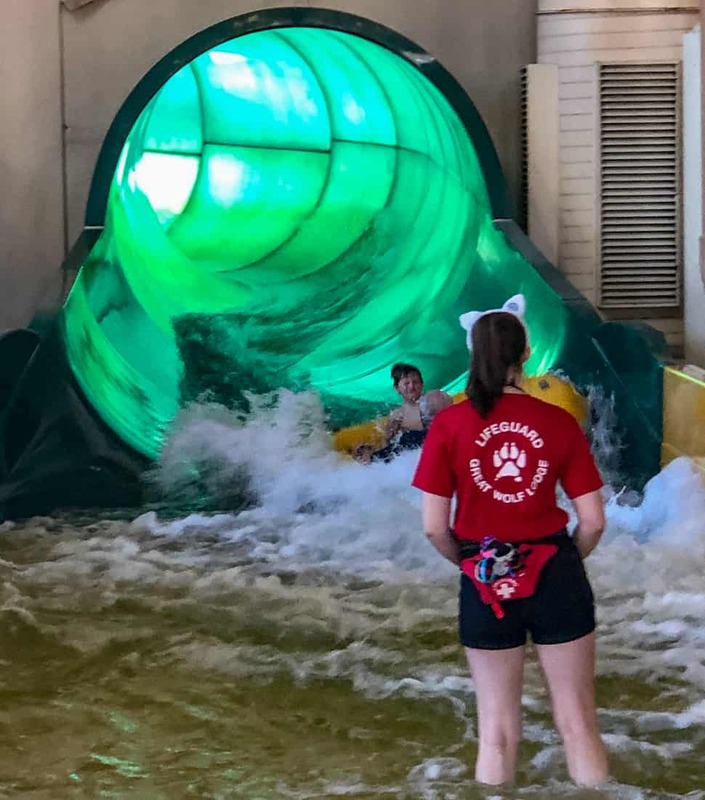 The individual attention he received was an example of the outstanding customer service Great Wolf Lodge is committed to giving guests. 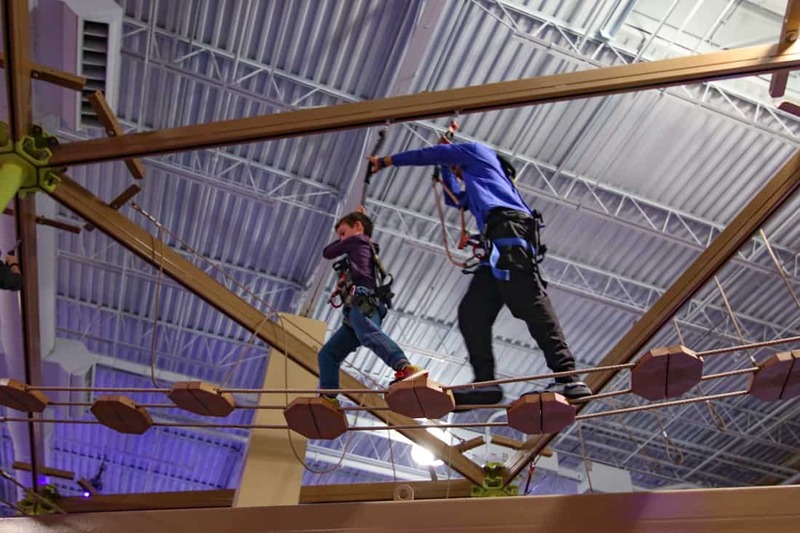 There’s a mini ropes course for those not yet 48 inches tall, too. We also had the choice of three bowling lanes, a small course for mini golf, and games like air hockey and bean bag tosses. 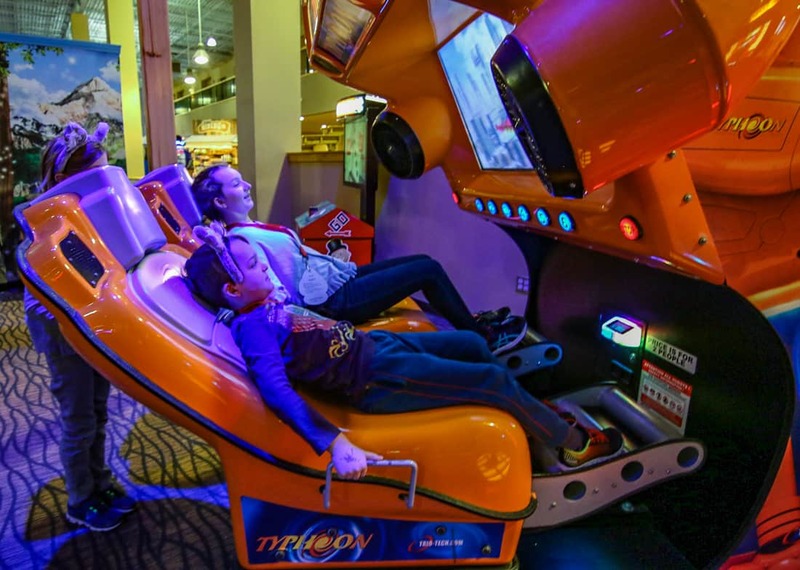 The adventure area combined with the arcade can fill hours of play time. We didn’t win, but we had fun trying. The resort offers an in-room dining experience just for adults called the food and wine pairings. Grown-up guests can choose various wines paired with charcuterie, cheese platters, or chocolate dip strawberries. They can be ordered just like room service. 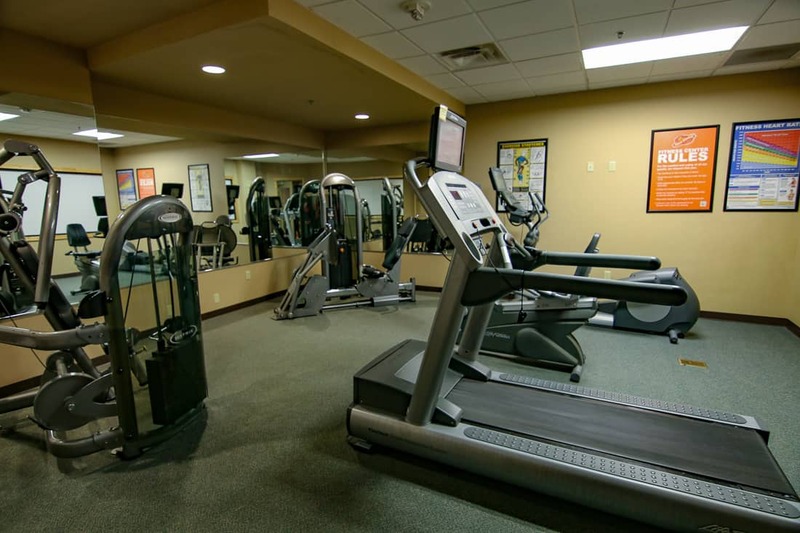 There is a nicely stocked fitness center on site for the parents, too, but let’s be honest. Has it ever been used? So how was this waterpark hotel? 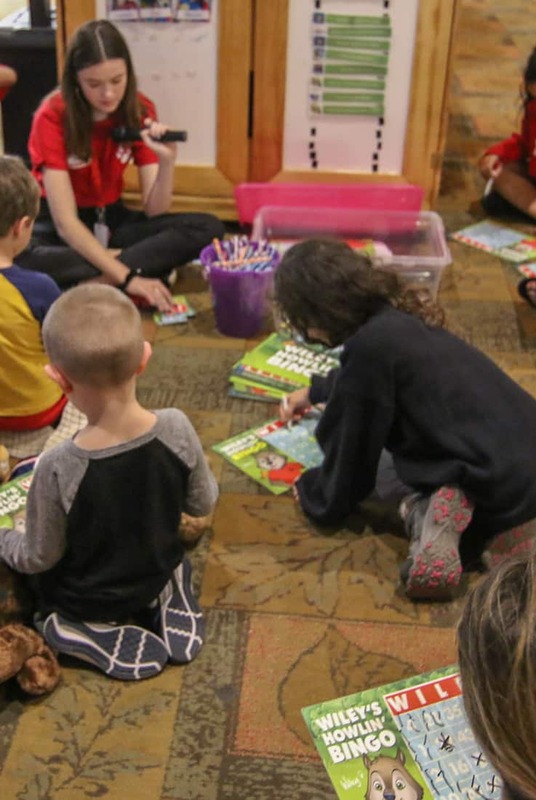 I found the service at Great Wolf Lodge attentive, friendly, and personal. The resort was well designed for family comforts in every experience. It’s not to be confused with a relaxing vacation but as a day of extreme stimulation and activity. Who would enjoy it most? Parents of toddlers and preschoolers who are shy to travel to more upscale resorts will find this trip an easy and enjoyable family travel experiment. This is especially true for families with babies and an older sibling. When my son was a baby and my daughter was 5, we would have gone a few times each winter. This trip also works as festive gathering of friends or cousins, even teenagers. I saw several groups of girls having a slumber party living it up, and I think the resort would keep all children 14 and under is a state of excitement. A weekend offers lots of physical activity when the weather isn’t agreeable. I still stand by my suggestion when gathering a group to get smaller, individual rooms instead of the larger ones if sleep is a priority. But if a slumber party is the objective, they work perfectly. So not only did I survive the experience, I had fun. 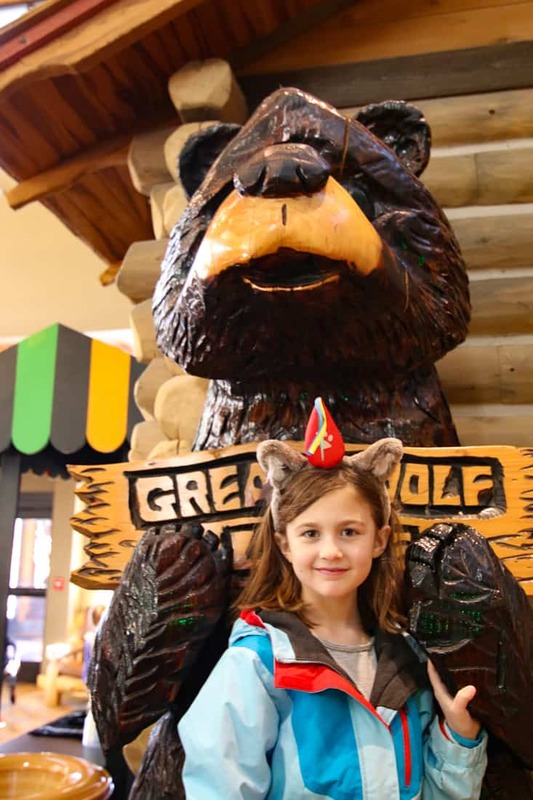 We were guests of the Great Wolf Lodge, but they had say in the content of this article, and all opinions are my own. 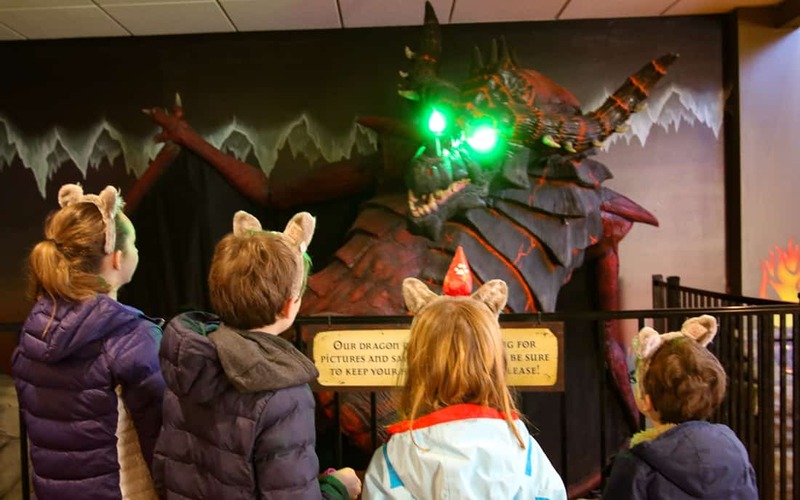 Check rates at Great Wolf Lodge.